We’ve all heard that Lisbon is the new Berlin, and with plenty of digital nomads and entrepreneurs flooding in it’s a great place to meet like-minded people. And where better to do it than at a co-working space? We digital nomads can be a bit of an introverted bunch, but there’s only so much working from an Airbnb in your pyjamas that one person can take. Every so often it’s great to get into the office and actually interact with other humans. Even if your head’s firmly down over your laptop, it’s nice to be surrounded by other people who just “get it”. Heden is a popular co-working space just off a busy square in Graça (they also have a space in Chiado as well). The flex desks are really spacious with lots of room to spread yourself out. There’s a lovely little lounge area with comfy sofas and books, ideal for screen breaks. It also has a huge downstairs area where talks are hosted (this is also where you’ll find the art studios). Tea, coffee and fresh fruit are included. Opening hours: Monday to Friday, 9am to 9pm: Closed weekends. Price: €8 for half day, €15 for full day, €50 for a week, €90 for 10 days or €150 monthly. Bworking’s co-working space is situated on Rua Latino Coelho in between the Picoas and Saldanha metro stations. The space, which is aimed at startups, freelancers, and digital nomads, is available 24 hours per day and 365 days per year. 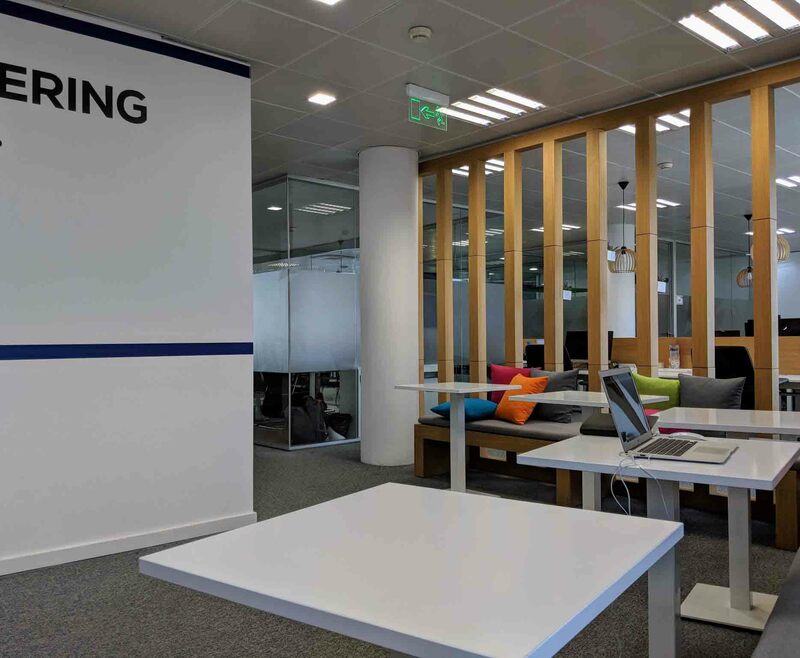 The space has flexible and fixed desks, several meeting rooms, as well as several offices for companies that want office space in Lisbon. Coffee, tea, and fruit is available in the lounge. Bworking also offers other courses and services including yoga, physiotherapy, and healthy eating workshops. Opening hours: 24 hours per days for all passes, except the 1-day pass. Price: €18.45 for a 1-day pass, €73.80 for 1 week, €184.50 per month. Trial Available? Yes (2-day trial). Don’t let the name put you off – Impact Hub welcomes freelancers and start-up entrepreneurs from private industries too, not just those focused on making a social impact. Impact Hub has two private Skype booths, a sunny workspace filled with natural light, and a big kitchen. It also has a whole raft of community events for members including movie screenings, networking drinks and wellness activities like yoga. Impact Hub is located next to the LX Factory, but not in it. Unfortunately, there’s a wall that separates it from the LX Factory and you have to walk around. The area it’s in is an unusual little amalgamation of buildings and businesses that includes the Museu Da Carris and Village Underground. Hopefully, the council will join the two areas up as I’m sure a lot of people would like to hop between the two. Opening hours: Monday to Friday, 9am to 6pm: Closed weekends. Price: €120 + VAT for the regular flex membership (Mon–Fri, 9am–6pm). Other options are available. Cowork Central is in the Cais do Sodré neighbourhood (and they have another base in Príncipe Real as well). As well as enviable views over the Tagus River, the office space also offers perks such as free coffee. Business-friendly amenities include fibre broadband, a dedicated room for Skype calls, and access to a printer and scanner. You can also rent a screen for €3, and get 24/7 access to the space on a quarterly or monthly pass. Trial available? Sort of: You can buy a day pass, but you’ll get them money back if you go on to buy a bigger pass. 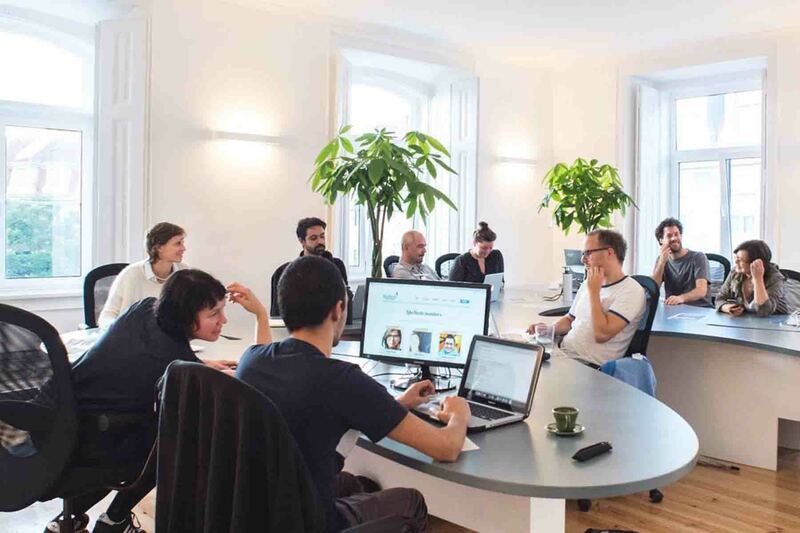 Established in 2009, Liberdade 229 gets the title of Lisbon’s oldest coworking space. Although you can e-mail to discuss getting a day or a weekly pass, the coworking space is really aimed at long-termers. The space has around 34 desks for freelancers and entrepreneurs, as well as a kitchen, ping pong table, meeting room, and a shared library with books and magazines. The internet is fast (100mbps), and the space is in a pretty central location near the Praça Marquês de Pombal roundabout as well. Cowork Lisboa is one of Lisbon’s oldest co-working spaces, and has been running out of the LX Factory complex since 2010. In addition to pay-as-you-go co-working, the space also offers longer term desk rental and meeting room rental. Unfortunately Cowork Lisboa can get quite crowded – those who don’t opt for a fixed desk package are often squeezed in shoulder-to-shoulder. It’s also surprisingly dark, without much natural light. There aren’t many private spaces for Skype calls, so you might find yourself in the corridor struggling to hear your client. The space is child friendly – great if you can’t afford childcare, but it can be very irritating if you’re looking for a quiet place to work. Price: Flex desk costs €12 per day, €40 per week or €100 per month. Monthly rental available. Trial available? Yes: free, but only up to 2 hours and only from Tuesday to Thursday, 9am-6pm. 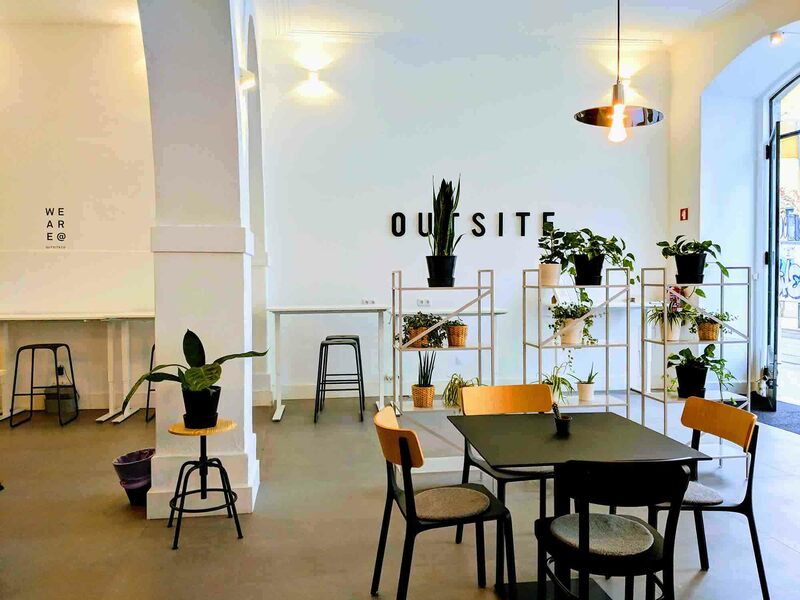 Outsite began as a co-living space but but it’s now also a large co-working area with space for 40 people. The space has big windows, which means it’s bright and light during daylight hours. There is also a meeting room, printer, and standing desks. Situated in Cais do Sodré, it’s in a good and central location for those visiting Lisbon. The Time Out Market is just a few minutes’ walk from here, and most city centre attractions are easy to get to as well. Two big plus points are the free coffee (many co-working spaces charge for this) and the number of events that Outsite hosts. It’s also very easy to buy passes on Outsite’s website, and you can also check yourself in. Opening hours: 8 am – 10 pm, Monday – Friday. Price: €15 incl VAT for one day, €70 incl VAT for a weekly pass, €150 incl VAT for a monthly pass. In addition to co-working desks, IDEIAhub also has private offices and meeting rooms available to rent. IDEIAhub also hosts regular events for members, such as social lunches and skills workshops, so there’s a real social vibe. Another perk? Free fresh fruit and beer on tap.The vibe that comes from IDEIAhub is quite corporate. Even though it was colourful and bright, and even though it had perks like free beer, it felt very much like a traditional office rather than a co-working space.Part of that could be due to the fact that it is a permanent office for many startups, and that vibe flows over into the co-working space who knows. This atmosphere isn’t necessarily a bad thing. It’s an atmosphere where you get your head down and get your work done and, being honest, often that’s exactly what you need as a digital nomad. Opening hours: Monday to Friday, 9am to 6:30pm. Closed Weekends. Price: €15+VAT for one day, €120+VAT for a monthly pass, €200+VAT for a fixed-desk with 24/7 access. IDEIA in Palácio Sottomayor has a slightly less corporate vibe than its Parque das Nações cousin. The design, although very similar, is a lot more fun with cool little booths to work from a suspended chairs to relax in. 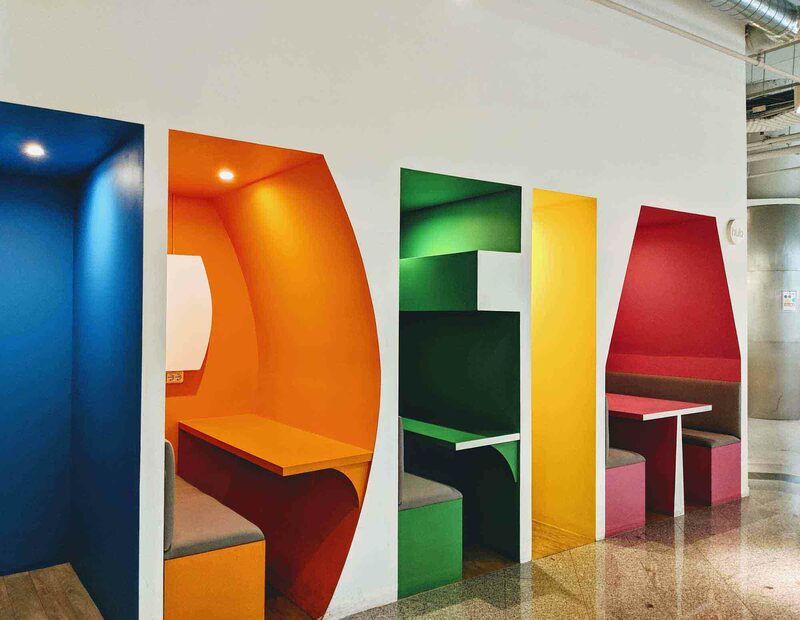 Like Ideiahub, Ideia is home to a lot of startups and companies in Lisbon but you’ll also find quite a few freelancers and digital nomads working there as well. This is probably due to its city centre location: the Parque das Nações branch is quite far from where most nomads are likely to be staying. And, yes, like Ideiahub, Ideia has beer on tap in the kitchen as well! Opening hours: Monday to Friday, 9am to 6:00pm. Closed Weekends. This is one to join if you’re looking for funding. 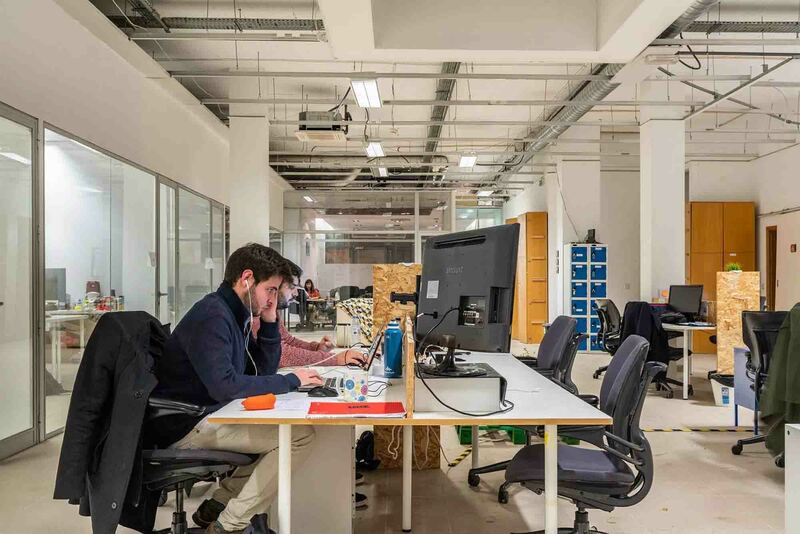 Start-ups and entrepreneurs will be excited to hear about Lisbon WorkHub’s partnership with Amsterdam Venture Partners, giving you a foot in the door with investors. The rest of us will need to make do with perks like room to stash your bike if you cycle to work, and a lounge to relax in if you need a bit of breathing space. Opening hours: 9am to 6pm, Monday to Friday. Closed Weekends. Price: €15 per day, €160 per month. Trial available? No, but you can book a tour. Not content with being “London’s Coolest Workspace”, Rohan Silva’s project Second Home is aiming to become Lisbon’s too. And with its location in the Time Out Market, it’s definitely one of the most enviable spots to work from. The light-filled space is dotted with plants to add to the feeling of inspiration and privacy. Unfortunately, although people love the plants, the chairs are quite uncomfortable. There’s also a lack of privacy, which can be important if you need to make client phonecalls. Coolness comes with a price, however, and this is also one of Lisbon’s most expensive co-working spaces. Including tax, the simplest membership costs around €250 per month. This isn’t expensive in many cities, but is more than double the average in Lisbon. If you’d like to arrange a tour of Second Home, you’ll need to book an appointment in advance. While many co-working spaces don’t mind if you show up, Second Home has a strict appointment policy (and a security guard to enforce it). Price: €220+VAT for one month. This creative warehouse in Poço do Bispo offers office rental, located in adorable 40m2 archways. It also has facilities for film makers and photographers including studios and make-up rooms. The website is a bit tricky to use, but it’s definitely worth a mention for all you creative types. Office-y co-working space that’s situated close to the Bairro Alto in Central Lisbon. As well as co-working facilities, Espaço 3D also offers meditation and yoga at its facilities. Opening hours: 8:30 am – 7:00 pm Monday to Saturday. Guests get 24/h access. Those that work together, work out together at this quirky co-working space. Personal trainer led walking, cycling and running sessions are held at 6:30pm every day, and are free for all members. During the day you have access to the usual co-working perks, such as fast internet. hOurSpace is a member of the Made of Lisboa community, which is made up of the city’s innovators. The space is calm and comfortable, with all the amenities you’d expect from an office (Wi-Fi, printers, scanners, free coffee). Long term users can use the space 24/7, and discounts are available if you buy hours/days in bulk. Price: €1.30-€2.50 per hour, €13 per day, or €40-45 per week. Avila Coworking has two co-working spaces, one at Av. da República, nº6, 1º Esq. and the other at Av. João Crisóstomo nº 30, 5º andar. The facilities are aimed at long-termers like startups and freelancers, as opposed to people who want to use the space for a day or a week. Facilities include a shared kitchen, lockers, and lounge area. It also has aircon, which is essential for working during the summer in Lisbon. You can visualise how these addresses line up with your hotel or Airbnb with our map, below. We’ll be adding to it (and this post) as more co-working spaces open up in Lisbon. And with more start-up investment coming to the city, we’re sure they will. Is there a great co-working space we missed? Let us know in the comments and we’ll be sure to check it out. 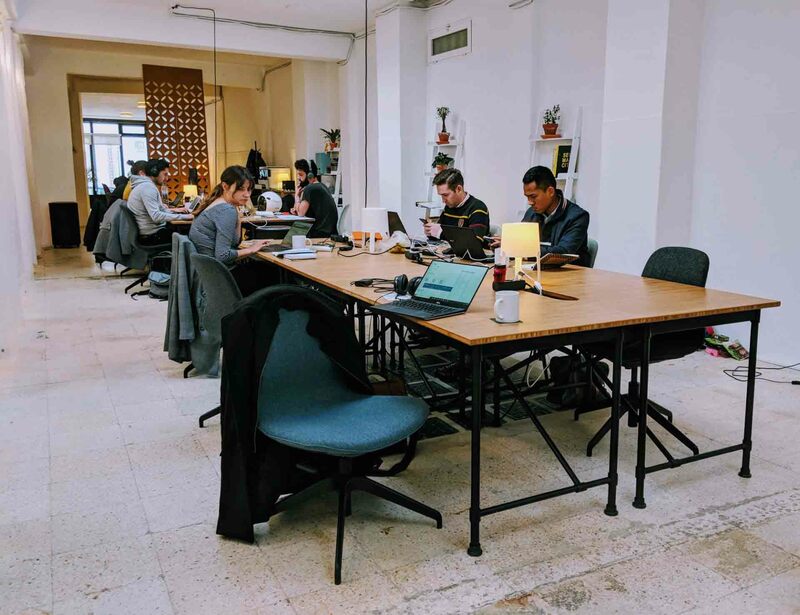 We also have an article about some of the different co-living spaces that have opened in Portugal, and a guide to the best co-working spaces in Porto. Don’t waste your time crossing the river to visit ministry of startups…ipt will be closed! You have to talk to unresponsive owner first who lives in another country. Save your time and energy. The Sea Office is a really nice coworking space in Costa da Caparica – 20 minutes from Lisbon by car. It is a 10 minute walk to the beach and has a really friendly vibe, excellent amenities, great internet and it is not too crowded. Canopy has closed the Lisbon location and is now in Sao Marcos. Thanks for the tip, Francine! Def need to add Liberdade 229, Lisbon’s first coworking space (June 2009) 🙂 34 desks in Lisbon’s top address. Unicorn just opened two coworking locations in the centre of Lisbon. The prices aren’t very visible (you don’t say how much it costs for a day’s coworking, for example) so I haven’t added it to the main list.